I spent some time this week putting the finishing touches to my monthly column in two church magazines, the Church Review in the Diocese of Dublin and Glendalough, and the Diocesan Magazine in the Diocese of Cashel, Ferns and Limerick. 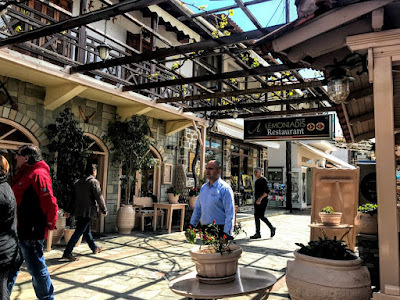 In next month’s column [September 2018], I am recalling a visit earlier this year to Mount Athos, which began from the small port of Ouranoupolis, the port from which most visitors begin their journey to the Holy Mountain in north-east Greece. Ouranoupolis is an interesting place itself, and might have been a topic on its own for this monthly column. The fishing village was originally known as Prosforion, but changed its name to Ouranoupolis, which means ‘City of the Heavens,’ in the mid-20th century to recall the glory of the ancient town of Ouranoupolis, built around 300 BC by Alexarhos, a brother of the Macedonian king Kassander, in the time of Alexander the Great. The exact location of ancient Ouranoupolis is not known, although it was located on or close to Mount Athos. It was important enough to have its own coins, which depict an eight-rayed star or the sun on one side and on the other side an image of Aphrodite Urania seated and holding a long, forked sceptre, surmounted by a ring. Next to the sceptre is a conical object surmounted by a star. The images on the coins indicate a cult that honoured Aphrodite, the goddess of love. Ancient Ouranoupolis did not survive for very long. A Swedish underwater expedition is said to have discovered monumental walls and possibly the remains of an ancient town in the sea in 1954. But the site has never been explored properly, and little is still known about the ancient town of Ouranoupolis. The earliest archaeological site at Ouranoupolis today is a Byzantine tower on the shoreline built in the 14th century. 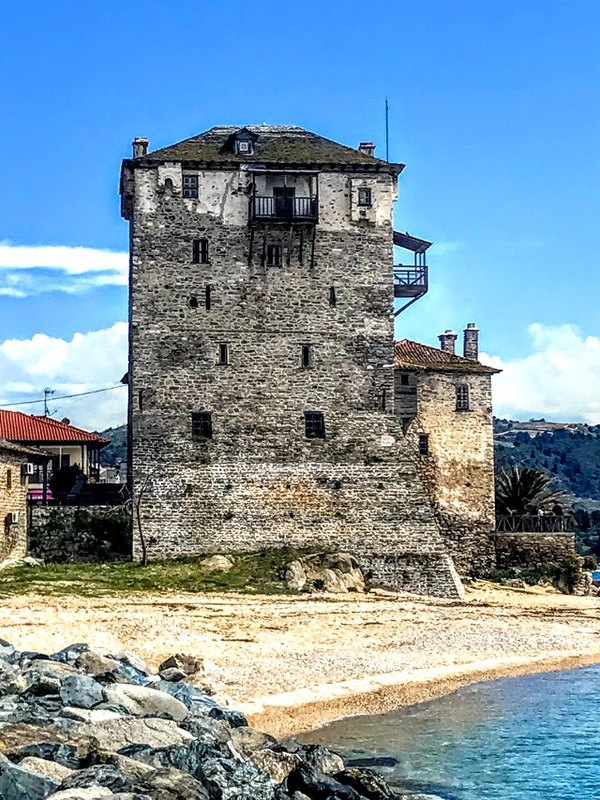 By 1344, the tower was the principal building of a metohi or outlying farm that belonged to the monastery of Vatopedi on Mount Athos. In May 1379, the Byzantine ruler, John V Palaeologos, stayed in the tower in May 1379, and issued various concessions in favour of Mount Athos. He removed the obligation for the metohi or farm attached to the tower to pay taxes and the original document is still kept at the Monastery of Vatopedi. The farm prospered and expanded, taking over all the land in the area, including the lands of the Monastery of Zygou which had gone into decline by then. The monks who farmed the metohi continued to live in the tower until 1922. It was set on fire in 1821 but was repaired sometime after 1865 when a few other buildings around it were added. These included an olive press with a well, an oven, stables, an ironmonger’s workshop and two large houses where the lay workers lived. The Greek war with Turkey after World War I ended in disaster in disaster in 1921, and a systematic genocide of Greeks living in Turkey was underway. Smyrna was burned to the ground and the majority of the Greek people there were killed. Whole Greek-speaking villages in Turkey were uprooted and refugees crammed onto boats and trains heading for mainland Greece. Greece faced a major crisis with the arrival of half a million destitute and traumatised people. The refugees were first taken to holding areas and then sent to different parts of Greece to begin a new life. In the past, I have told stories of how some of these refugees were housed in Tsesmes, near Rethymnon in Crete. In response to these demands, the Greek government confiscated the monastic lands around the tower at Prosforion to settle some of the destitute refugees. The monks left promptly for Vatopedi and the first boatload of refugees arrived in 1922. These first refugees were from Caesarea, and included former merchants and carpet wavers. At first, they moved into the abandoned monastic buildings and used them as communal living quarters until the first houses were built. More refugees arrived each successive year until 1928, and gradually a small village grew up with 90 cottages. 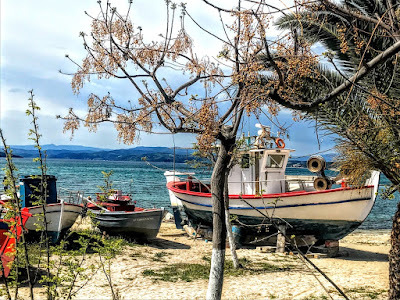 The later refugees were once prosperous fishermen and their families from the Princes Islands off the coast of Constantinople in the Sea of Marmara that connects the Black Sea with the Aegean Sea. The village name was changed from Prosforion to Ouranoupolis in 1946, and became a village in its own right, separate from the neighbouring town of Ierissos. The first refugee houses were white-washed, red-tiled, one-bedroom, single-storey houses built by a German contractor, each with a small garden. Each family was given a cottage, a plot of land, some olive trees and 10 sheep. But when the sheep soon died from starvation they were replaced by more resolute goats. The fishermen were given grants to buy boats. Living conditions were harsh, water was scarce, and the dry land produced little. The only available source of employment nearby was on Mount Athos, and the men often spent months away from home in the monasteries, working as labourers and struggling to support their families. The village remained isolated from the rest of Greece, there was no road out, and it was a 9 km journey along a mule track through the mountains of Halkidiki to Tripiti. From there, the final leg of the journey involved either walking or taking a boat. An ancient edict prohibited building a road ‘on which a wheel could run’ to Mount Athos and so Ouranoupolis remained without a road and isolated for many years. After a particularly harsh winter, the villagers, led by Ioannis Tozakoglou, took matters into their hands in 1959, and with spades, shovels and bare hands they built a dirt track that became, the first road to the village. The first car to reach the village was a British Land Rover. The road was improved soon after, a daily bus service was introduced and with the arrival of tourists the village was gradually lifted out of poverty, eventually becoming the prosperous tourist resort it is today. 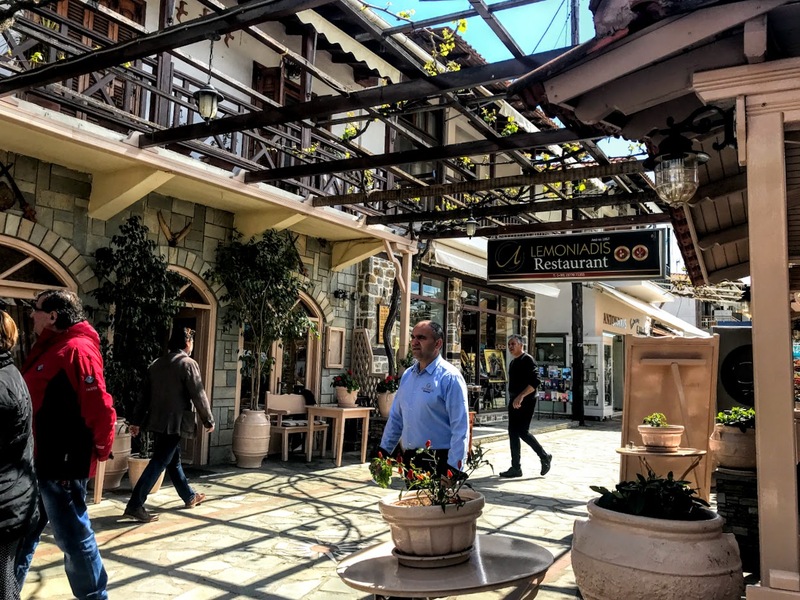 But even at the height of summer, Ouranoupolis can remain a relatively restrained place, with the laid-back atmosphere disturbed only in the early morning with the arrival of buses bringing people to catch the ferries to Mount Athos, and returning again in the afternoon in time for lunch.